Bass Pro Shops plans this fall to open the company’s first store since the closing of the merger with Cabela’s. 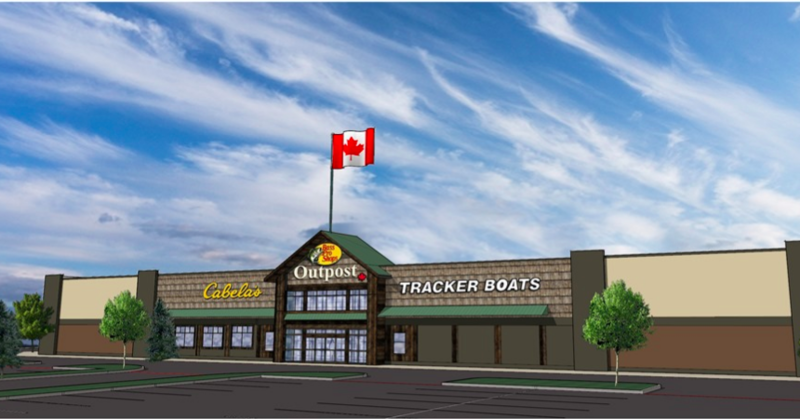 The new Outpost in Halifax, Nova Scotia will feature dedicated sections for Bass Pro, Cabela’s and Tracker Boats. Bass Pro also announced that its location in Rogers, AK, will undergo an extensive renovation to feature Bass Pro Shops, Cabela’s and Tracker Boats together under one roof for the first time. The location will add a new boat center and significantly expanded fishing and apparel departments. The all-new Halifax location is scheduled to open later this fall with a special ribbon-cutting ceremony and a weekend-long celebration highlighted by special appearances, family events, giveaways and more. The 50,000-square-foot destination retail experience, located in Dartmouth Crossing, will offer an assortment of qulity gear for fishing, hunting, camping and boating, including popular brands from Bass Pro Shops, Cabela’s and Tracker Boats. The unique store design features detailed wood construction and stonework alongside hand-painted murals that wrap the store’s interior, depicting familiar scenes from the Nova Scotia landscape, notably Peggy’s Cove. Museum-quality wildlife dioramas including white-tailed deer, moose, black bear, wolves, waterfowl and raccoons provide customers an immersive outdoors experience. Other exhibits feature Bluefin tuna, Atlantic salmon, striped bass and other fish species in a nod to the area’s rich fishing heritage. The store also offers an indoor archery range. Bass Pro Shops has hired approximately 145 outfitters to deliver quality customer service to outdoors enthusiasts in the Halifax area. In addition, the store will offer free events, outdoor skills workshops, educational seminars and demonstrations throughout the year for adults, kids and families that will help maximize outdoor fun by teaching new skills and improving existing ones. Information regarding an official opening date and celebration event will be announced in the coming weeks. The Halifax location will join 15 other Bass Pro Shops and Cabela’s locations across Canada, including those in Alberta (Calgary, two locations in Edmonton, Rocky View); British Columbia (Abbotsford, Nanaimo, Tsawwassen); Manitoba (Winnipeg); New Brunswick (Moncton); Ontario (Barrie, Niagara-on-the-Lake, Ottawa and Vaughan) and Saskatchewan (Regina, Saskatoon).